Trisha Brown has been choreographing for half a century; from today’s vantage point her development can safely be termed evolutionary. Examining the path of her career, it’s easy to trace the innate logic that led her from simple (nevertheless ingenious) pedestrian ideas, actions, and gear to complex creations, rich in theatrical artifice, that somehow remained pure. Perhaps the most remarkable aspect of this journey is the interest aficionados of the arts still take in Brown’s works of long ago. As part of its On Line: Drawing Through the Twentieth Century exhibition, the Museum of Modern Art scheduled performances on January 12th, 15th, and 16th (at 2:00 and 5:00 each day) of Brown’s Sticks (1973), Locus Solo (1975), Scallops (1973), and Roof Piece Re-Layed (a version of the 1971 Roof Piece). Brown’s works of the early Seventies–the period in which it became clear that she was a leading figure in what would be called postmodern choreography–were as fresh as lemonade made from scratch, as I remember it from my first visit to Paris. When you ordered un citron pressé in a modest to downright humble café, you were brought a pitcher of cool water, an empty glass tumbler, a lemon, a small serrated knife, and a downsized reamer (used in old-fashion kitchens to squeeze the juice out of citrus fruits). As I recall, there was a basin of sugar already on the table; ice was unheard of. The lemonade you produced with this simple equipment was the very essence of the drink–just as Brown’s early pieces offered the salutary shock of dancing that’s been reduced to its essentials. Today, four decades after Brown created them, those dances still look new. The choreography is divinely matter-of-fact. Though most of the action requires extraordinary skill, the tone with which it’s executed is unemphatic–gentle and calm, full of reticent grace. Should anyone ask you what’s going on in these dances, you might even say that each performer simply executes the task she/he has been given. Simply executing the tasks one has been given. Isn’t that a possible prescription for a satisfying life? Those who think not must rest content with the dancers’ echoes of the incomparable fluidity Brown displayed in her performing days and the constant evidence in her choreography of a singular intelligence and a wit expressed in swift, tiny flashes, like the lights of fireflies in a darkening sky. The MoMA program took place in the museum’s Atrium, from which you could gaze down on the expansive street-level lobby and up to look-out points on four floors of gallery space. The venue itself is alive with architectural possibility. 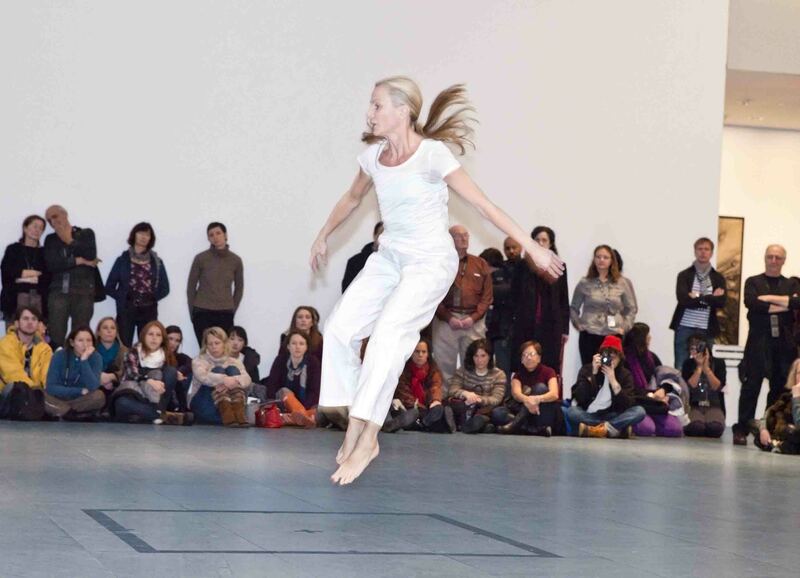 The audience, standing or sitting on the Atrium floor, bordered a huge square marked off for performance, the onlookers becoming a living frame for the dancing. 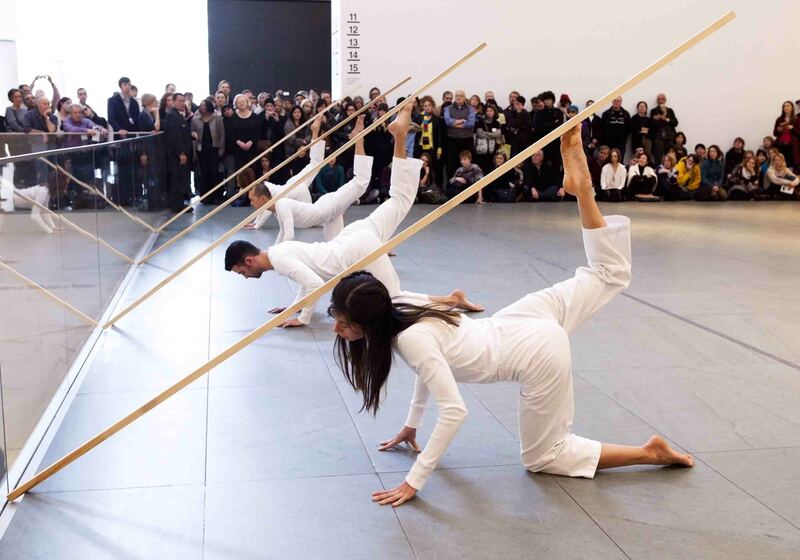 The program opened with the 1973 Sticks in which four dancers in snug long-sleeved white jerseys and loose white pants partnered with wooden beams maybe two inches square and ten feet tall. Working in unison, the performers seemed to be the puppeteers and the sticks their puppets, as they executed extraordinary feats of balance so that the sticks could lean at precarious angles or meld, ends touching, into a single line that floated, wavering just a little, a couple of feet above the ground. Locus Solo (from 1975) was performed by Diane Madden, who has worked–and bonded–with Brown for some three decades. Today, she’s the company’s rehearsal director. A small, strikingly lithe woman with a blond ponytail and a visible delight in dancing, she took possession of a small square marked off dead center in the larger space. Her movements, themselves straight-edged and scrupulously within the indicated boundaries, looked as if she were exploring the parameters of her domain–and its possibilities, rather than its restrictions. After a time, the addition of some leaning, almost falling moves to the strictly vertical ones allowed Madden to suggest a lyrical vein in her activity, though she took scrupulous care not to overemphasize it. Finally Brown’s and Madden’s combined alchemy revealed that the small dancing ground was larger than we’d first imagined. It had a third dimension–height; it was really a cube. What more could anyone want? The program’s most complex piece was Roof Piece Re-Layed, an ingenious adaptation of the 1971 Roof Piece that must have had pavement-bound spectators tilting their heads backward to ogle the tops of buildings stretching downtown and then westward from a starting point in SoHo. The original piece–which I’m sorry to say I know only by hearsay–had 15 dancers, clad in red for visibility, positioned at least a block apart on the route’s rooftops, transmitting a string of gestures down the line to one another as they stood in the sky. None of the dancers could see more than a few of the others. The starter, Brown herself, improvised the initial material. Once the wordless semaphored “message” reached the end of the line, it traveled back again to the beginning, modified as is a verbal message in the children’s game of Telephone. Among the participants were Liz Thompson, Valda Setterfield, David Gordon, Douglas Dunn, and Sara Rudner. 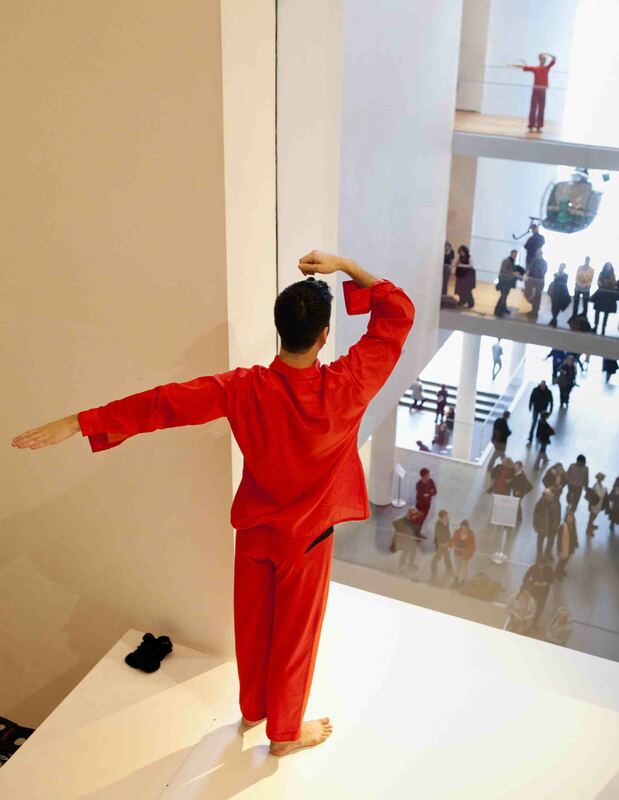 In the re-imagined (as they say these days) version for MoMA, the dancers–eight of them this time–were again in red. Six appeared at various levels of the Atrium’s walls behind rectangular glass panes of different sizes. Two were unshielded; you could have reached out and touched them, if you dared. One of these, a man, was down in the lobby that the Atrium overhangs. Standing on a low block near the Sculpture Garden, he looked like another statue that had simply added motion to its traits. Madden stood out on the Atrium floor looking like–well, Madden, who, once seen, can’t be forgotten. As in the original version of the piece, any one dancer could see only a few of the others. It seemed impossible to decipher which of them was the “starter.” To me the material for all eight rooted-in-place bodies looked memorized, not improvised, because it seemed to be accurately copied as it traveled. I could have asked about this afterward but I didn’t. I didn’t really want to know. In an era like ours, which has made privacy extinct, art at least should be allowed to keep some of the mysteries that are part of its (al)lure. This is exquisite writing and reflection, Tobi. Thank you! Once again TT has made me see what she saw, which is almost (not quite, but almost) as satisfying as actually viewing the dancing with my own eyes. It seems to me that Brown’s use of the MoMA space, which I find thoroughly offputting when I go there to look at more stationary art (it reminds me of an airport, frankly) is imaginative and brilliant. This is no surprise, since she grew up among the tall trees of the Pacific Northwest, finding beauty in their majestic height. You see this influence in her early work, at least the photographs of it in “Trisha Brown: Dance and Art in Dialogue, 1961-2001.” I’m glad that dialogue continues, with a new immediacy, in 2011, but clearly without the bombast we see in other choreographers’ work, as well as in life itself. Alluring writing on alluring dance. The Trisha Brown Dance Company graciously allowed us to record a preview interview about the performance and allowed us to livestream the final performance. Both are available on MoMA.org. “In an era like ours, which has made privacy extinct, art at least should be allowed to keep some of the mysteries that are part of its (al)lure.” That concluding sentence is wonderful because it epitomizes the Zeitgeist and defines art.